“With our unique kit, vendors and card issuers will now be able to see for themselves how NFC contactless payments will impact on their customers,” says Proxama CEO Neil Garner. KIT: Provides tools for developers to test and visualise NFC payments. Click to enlarge. NFC software specialist Proxama has announced a MasterCard mobile payment reference kit for developers of NFC payment applications. Kit users can test different payment options, try out typical payment scenarios, test compatibility and evaluate variants of payment procedures such as the changing the required level of authentication. The kit includes a Samsung Galaxy S phone, with NFC capability supplied by a microSD add-on, pre-loaded with a special version of Proxama’s NFC mobile wallet software. Buyers also get five card profiles, each representing one of Mastercard’s card products, a contactless card reader, and Mastercard terminal simulator software. 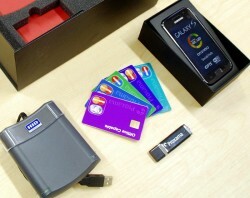 The kit will be available for purchase by Mastercard members and technology partners. “Everyone knows that NFC payments are coming but, up until now, have had no way of visualising or testing it,” says Proxama CEO Neil Garner. “With our unique kit, vendors and card issuers will now be able to see for themselves how NFC contactless payments will impact on their customers. “Having the Mastercard applets in the kit means that users will have the confidence that they are running tests with products that are being used worldwide from a global payments leader,” Garner explains.